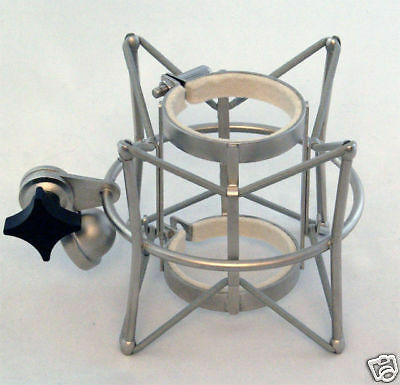 QM-17 Modern Mic Shock Mount fits most large size mics up to 2.4"
Free shipping applies to the Continental US only. Now even a better deal with free shipping! Wow, take a look at the the QM-17! Be sure you order the correct shock! Check the diameter! By removing the fiber and using various 3/8″ weatherstripping, you can create a custom fit for any mic from 2.15-2.4″ (54.6-61mm)! Microphone clamp felt covered to protect your microphone from scratches. Fits microphones made by EV, Rode, Marshall, MXL, Shure and others! The unique design of this shock mount is it has less contact with the mic, giving a cleaner, more distinct sound quality. The set screws allow a tight fit, assuring the mic will never fall out of the mount! With 2 set screws on small bands, you can even hold tapered mics tightly without any movement. This item is a free-shipping item for those in the continental US only. We will ship goods based on the best options for delivery, and items may go via USPS, UPS, or FedEx, at our discretion. Alaska, Hawaii, APO addresses and US Territories will ship Priority Mail for the best shipping rates but do not qualify for free-shipping. For International shipments, we only ship via USPS Priority Mail. We ship items Monday through Friday, and most completed sales are shipped out within 1 business day. If there are delays (adverse weather, illness, etc. ), we will notify you what the problem is and when it will ship. Local Metro DC area residents are welcome to pick-up at our Fairfax or Lorton offices and save on shipping. Welcome to The Fine Print. Please read this so you know the terms on our items! We offer top quality Q-Mic products (occaisionally, we might find awesome deals elsewhere), unless specifically stated, all products re new. Q-Mic attempts to treat all customers fairly and we do or best to respond promptly to email and phone calls. We only ask you not to buy if you’re not going to complete the transaction! We’d rather leave positive feedback! We’re proudly operated in the USA, and have been a full-service Internet merchant based in the Washington DC suburbs for over 25 years, with our own dedicated warehouse located in Lorton, VA. WE DO NOT DROP SHIP! We offer a 10-day, unconditional, no-strings-attached 100% money-back satisfaction guarantee. If the item doesn’t meet your expectations, or you simply don’t want it, it’s ok! Call or email us to get an RMA # and we’ll refund your entire purchase (excluding all shipping fees) price upon it’s return. We don’t want you to keep anything you aren’t pleased with. The item needs to be complete, with all packaging materials, instructions, cables, cards, etc. returned. Items left out will delay your refund. We offer a full one year warranty. If any part fails during the warranty period, simply call or write to get authorization and send it to us it and we will fix or replace it at our discretion and return it to you at no cost. For warranty repairs, we will cover your shipping costs! Look at our recent feedback and see what our customers say, as our eBay friends are truly all that matters. Our 100% positive feedback shows we provide what we promise! You can safely purchase from us, and be assured your item will ship quickly and be exactly what is described in our eBay auctions! (5-Star) RATING. Low, or ratings on the DSR form cause many problems! Most eBayers aren’t aware of how important our DSR scores are and how much they affect us. Because of their anonymous nature, people will leave low scores for many reasons, some valid, some not. Please! Before leaving negative feedback or low DSR scores, contact us and let me know what the problem is and we’ll resolve it quickly and professionally. Almost all low scores, or bad feedback is directly related to a lack of communication. I post my phone number in all my ads, so call or email and we’ll fix WHATEVER you think is wrong. This is so much easier than negative responses or low DSRs. We appreciate your business and our only goal is to sell you quality products at a great price. Lets leave the drama on Broadway! Thanks for your interest in our products! We’re not anonymous! If you have any questions, feel free to email or call (703)591-7070 between 9am and 6pm M-F ET. Posts related to QM-17 Modern Mic Shock Mount fits most large size mics up to 2.4"